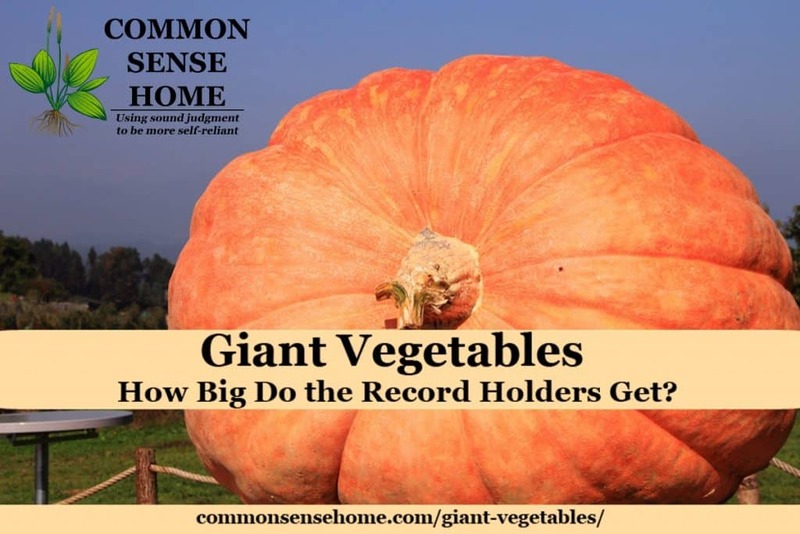 Giant Vegetables - How Big Do the Record Holders Get? You are here: Home / Gardening / Giant Vegetables – How Big Do the Record Holders Get? The infographic below is courtesy of Sun Leisure. They're a part of the 2016 Harrogate Autumn Flower Show (September 16-18), which features a world-famous giant vegetable growing competition. I don't typically share this sort of thing, but thought you all might find it as interesting as I did. Special seeds – Competition growers focus on varieties that naturally grow larger. Back in 2013, a grower paid $1600 for a single pumpkin seed. Healthy soil – Veggies grow best with the right pH, plenty of organic matter, and rich, aerated soil. Fertilizers – Big vegetables have big appetites, but it's best to provide slow acting fertilizer for steady growth. Choose the right fertilizer combination for your vegetable. Watering Deeply and Regularly – Too much water and the veggie may split, too little and growth is stunted. Compost tea is a great way to introduce addition nutrients to boost disease resistance and speed growth. Hand Pollination – To make sure your vegetable only makes babies with other big vegetables, hand pollination is a must. Hand pollinate by gently swabbing the stigma of the female flower with the pollen-laden male stamen, getting as much pollen on the female flower as possible. Pollinate your flowers first thing in the morning to beat the bees. Sowing Early – Starting seeds indoors or in a heated greenhouse gives them more time to mature. Extra Room to Grow – Competition growers use raised beds and special containers to accommodate larger and longer roots. Thinning the fruit – Less fruit = less nutrient competition. Prune all but a few of the largest, healthiest fruits or vegetables, and then cut down to one later in the season, giving it the best chance of growing into a monster. Pest control – Pests create stress, which slows growth. Take steps to prevent pests in the first place, and use natural garden pest control to keep any tiny mauraders at bay. Patience – Even if you do everything right, giant vegetables take time to grow. World record: 130.5cm long, grown by an Australian teenager. This is longer than a golf club and the equivalent of about 5.5 regular cucumbers. World record: The heaviest ever beetroot was recorded at 23.4 kg (51 lb 9.4 oz). This is the equivalent of about 70 regular beetroots. The longest beetroot was 7.212 m (23 ft 7.9 in), grown by UK gardener Joe Atherton. This is longer than the average great white shark. World record: The world’s heaviest cabbage clocked in at 62.71 kg (138.2 lbs), about the same as the average orangutan and about around 35 regular cabbages. World record: The heaviest ever pumpkin was an unbelievable 1,503 kg (2,323 lbs), grown by Switzerland’s Beni Meier. This is heavier than a polar bear and the equivalent of about 128 regular pumpkins. World record: The record for the largest carrot stands at 9.07 kg (20 lbs) and was grown by the UK’s Peter Glazebrook. This is the same as 60 normal carrots and heavier than a bowling ball. World record: 93.4 kg (206 lbs), grown by Bradley Wursten from Holland. This is about the same weight as 206 courgettes and roughly the same as a dolphin. World record: 5.7 m (19ft 2in), another world record for Joe Atherton. This is about the same height as a giraffe. World record: The heaviest ever leek was 9.75 kg (21.5 lbs), and was apparently grown listening to Glenn Miller music. World record: the heaviest potato weighed 4.98 kg (10 lb 14 oz), heavier than the average domestic cat. World record: American, Harry Hurley, grew a bean that was a whopping 1m 30 cm (4ft 3in) in 1997. This is about the height of an average nine year old child. Do you Dream of Giant Veggies? If you care to try your hand at growing the really big vegetables, check out the books below. If you have a favorite tip for bigger veggies or a veggie growing question, leave a comment on the post. Keep gardening and stay inspired!